These photographs from the 1920s are of the wife and children of Virgil "Zeke" Barnes, a pitcher who played at the major league level for seven seasons, primarily for the New York Giants. 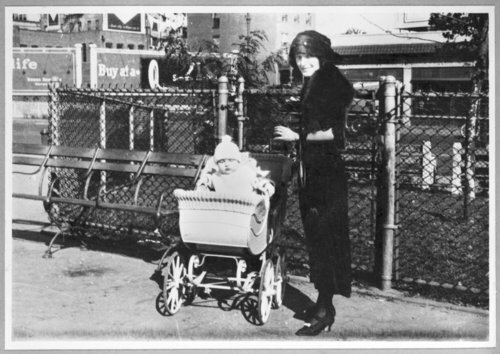 The first four photos in the sequence are believed to have been taken in 1925 in New York City. Virgil and his wife Della were both raised in Jackson County, Kansas. They married in July 1920 in Rochester, New York, where Virgil was playing for the minor league Rochester Hustlers. He joined the New York Giants as a regular in 1922. During the offseason, the couple lived in rural Jackson County. They had two children--a son James, born in October 1922, and a daughter June, born in September 1924. In the mid-1930s, the family moved to Wichita, where Virgil and Della remained until Virgil's death in 1958. These photographs from the 1920s are of the wife and children of Virgil "Zeke" Barnes, a pitcher who played at the major league level for seven seasons, primarily for the New York Giants. The first four photos in the sequence are believed to have been taken in 1925 in New York City. Virgil and his wife Della were both raised in Jackson County, Kansas. They married in July 1920 in Rochester, New York, where Virgil was playing for the minor league Rochester Hustlers. He joined the New York Giants as a regular in 1922. During the offseason, the couple lived in rural Jackson County. They had two children--a son James, born in October 1922, and a daughter June, born in September 1924. In the mid-1930s, the family moved to Wichita, where Virgil and Della remained until Virgil's death in 1958.